...well it is a bit older as I had to purchase the components when I could afford them (for example, I now could get 24G of memory for just a bit more than what I paid to get 12 - Of course that would mean having to upgrade to Win7 Pro (about another 100$+) as Premium only supports up to 16G. However , considering what I have been struggling with all these years, it is a significant step up and I'm still very pleased. The one nice thing about DIY is NO BLOATWARE or "hidden" stuff that competes for processor/memory resources. I open up Task manager and the list of running processes is doesn't even take up half the window in that tab (compared to three "pages" on my notebook). With the memory in Tri-Channel configuration it will mean faster render processing as the pipeline between the CPU and memory is like a six lane superhighway compared to the two lane "country road" on my old notebook. My intent was to build a lean mean rendering machine. I think I succeeded. on a side note, that render with lantios looks amazing. its the kind of "soft" look im trying to figure out how to make. Thanks. Trial and error for me, with lots of help here on the forums. I am very far from having a solid grasp of anything. I like your render - there is, of course, no one 'right' style or anything. If it works, it works, and I think this one works! Cool, 12G is twice what I have! Yeah, I hear you about bloatware, that was the only upside to this machine being over a year old when I got it, the warranty ran out quick so I could take it all off. As you don't have a net connection on it you shouldn't have to worry about an Anti Virus program either. As I have been laid off form my job (of nearly 18 years tenure - long story Details in ma DA Journal) I now have a lot of time on my hands. Currently installing everything on the new workstation and setting up the runtimes. The process is going surprisingly smoothly (even though I'm doing it the old fashioned way, one file at a time) as this rig is really really fast. Getting my activation code for Reality 2.5 as I have to register offline since the workstation has no net access (on purpose). Need to go out and get a 16 or 32 GB flash drive which would help speed up the process a bit more. ...actually I do have it installed but only turn it on for certain operations. ...such as when I need to plug in the USB modem to register new software online or directly (some apps don't have offline registration) or DL/install the latest Flash player so the PP2012 library system will run properly (for some odd reason this needs to be a direct DL/Install using IE, it won't work from a flash drive, nor with FF which has better security). The cool thing is I can be online or doing postwork on the notebook while rendering without interfering with the process (and I now have a second notebook primarily for writing and net surfing so that helps the workflow even more). UE2 Soft - same as UE2, but used Occlusion w/soft shadows. Render time: 6 m 48 s.
Luxus - LuxRender via Luxus. One distant light translated to sky2. Only material setting was glass for the eyes. Render time: around 9 h, 5k s/p. Note: there are problems with materials. I'm a newbie with LuxRender. 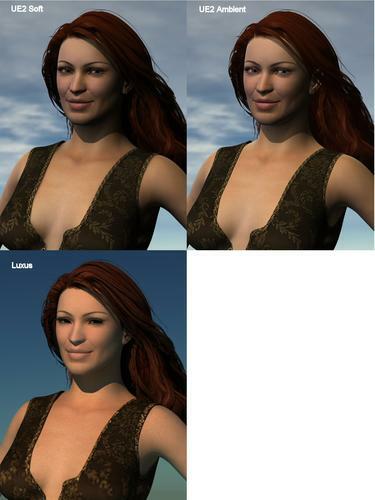 LuxRender gave errors about the tif files for the eyes, which is why she has demon eyes. I think Luxus is lowering the resolution of all the textures by default. Translation of skin textures/shader seems weird. The DAZ skin material uses UberSurface and includes subsurface scattering. The way Luxus translated that makes the skin look strange to me. I have posed the model looking directly into the sun. As photographers know, you should never do this. The dynamic range of a camera is not as wide as the human eye. Pictures posed like this come out badly unless you use fill flash. However, I'm not trying to render an image that would look like a photo, and the human eye has wider dynamic range than cameras do. The no ambient image shows the harsh shadows you get with just a distant light. I'm guessing the Luxus image shows how much ambient scattered light you would really get, but I don't like the look of this image because of the material issues. I have never been able to get UE2 to produce result I like. Maybe I gave up too quickly on UE2 and never learned how to use it correctly. I get results I like better using multiple distant lights to fill in the ambient and it renders faster than UE2. The Ring of Light produces very good looking results too. There is a slight difference between the Distant Lights and Ring of Light images in the amount the shadows are filled, but this is just a mater of adjustment. You can independently raise and lower the ambient intensity in both of these images. Sounds like you're well catered for then. The ROL and the distant light look to give the best results there. Yep, now one of the "SINless". Fortunately they gave me a bit of a severance so I have something to equip-er-fall back on as well as my incoming tax refunds. Looks like it's time to get fitted for a Securetech jacket and find a clinic to get that jack and SL II with Rangefinder implanted. Hear WW has a spring sale on the Pred-III. Also need to gut the old notebook compy and turn it into a matrix shredding deck. Now where did I leave my Fixer's telecom address? Still would love to see someone come up with a Predator (any series) and/or real "chrome"
Nice comparisons. For now since i dont know to much about luxus I've gone back to fiddling with the lighting in 3delight. For my test i used UberEnviorment2(4xhi quality) set to 50% intensity with 2 spotlights above her pointing down at her, one on the left with color 215-63-34 30% intensity, Deep shadow maps with 50% softness, and the right 91-101-255 with 45% intensity with the same settings for the shadows. 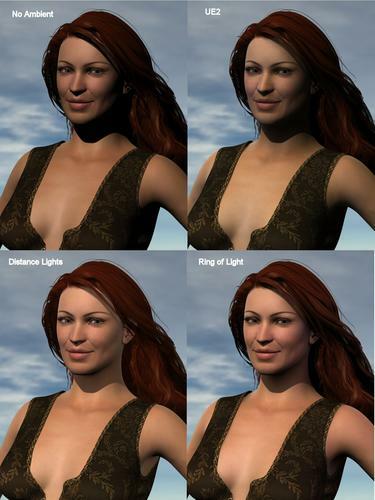 As well as one spotlight in front of her slightly below her with the default light color set to 45% intensity with the same shadows as the others. Then i have 2 distant lights 1 in front of her(slightly rotated to the right, or her left) set to 45% and same shadows as my spotlights, and 1 behind her set to 130% intensity with no shadows. If anyone could give me some criticism it would be very welcomed. If you mean the creature then Swidhelm has done a few to be found on ShareCG. ...actually, the Predator II & III are the sidearm of choice for most Shadowrunners. Fully integrated Smart fire system with a 15 round clip at a very "reasonable" price. ... For now since i dont know to much about luxus I've gone back to fiddling with the lighting in 3delight. For my test i used UberEnviorment2(4xhi quality) set to 50% intensity with 2 spotlights above her pointing down at her, one on the left with color 215-63-34 30% intensity, Deep shadow maps with 50% softness, and the right 91-101-255 with 45% intensity with the same settings for the shadows. 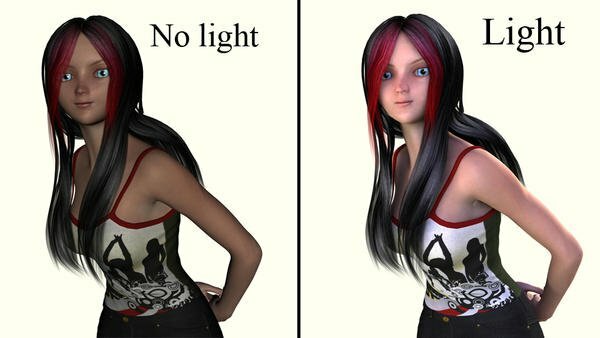 As well as one spotlight in front of her slightly below her with the default light color set to 45% intensity with the same shadows as the others. The one with lights definitely looks more interesting than the one with just the DAZ headlight. I'm not sure what effect you are trying to achieve with the lighting. You have a orange spot light on the left and purple spot light on the right. Why are you using two different colored spot lights? Are you trying to change her skin tone? At least to my eye, her skin looks a little too pinkish, like she is blushing. Maybe that is the effect you were trying to achieve. I would generally not use lights of different colors unless I was trying to achieve some effect, like say a red/orange light coming from a fire mixed with ambient white light. Maybe this is suppose to be a club dance floor with multi colored lights. So what were you trying to achieve with the lighting? I probably would have had decent results after 2 hours. I can either set a time limit or a Sample limit from what I've seen in the configuration stuff. ...the ability to pause the render process and resume later is one of the features that attracted me to Reality as I didn't like the idea of having my notebook running for hours on end without a rest. (cooling for notebooks is no where near as good as full workstation PCs). Currently shopping for a good UPS that regulates power so I can leave a render go overnight and/or while I am away. Another reason I built the workstation as a standalone, along with no interruptions from those pesky auto updates. I have a Cyber Power UPS I got from staples, I love it, even came with a windows app that will let me see power consumption. Another render from DS 4.5 Pro with Ring of Light used. I like how the shadows came out on the render. This time I rendered V5 Nichole with Despoina Hair, so the rendering time has increased to 1 hour 35 minutes 57.63 seconds. So far Ring of Light is one of the easiest light set to use and I like the results.